The animated television series Liberty's Kids is geared toward audiences that range in age from 7 to 14 with the purpose to teach them about the origins of the United States of America. The series focuses on major events that happened in the U.S. such as the Revolutionary War, Declaration of Independence and the Boston Tea Party just to name a few. Celebrities such as Walter Cronkite, Sylvester Stallone, Ben Stiller, Billy Crystal, Dustin Hoffman, Arnold Schwarzenegger and Don Francisco's voices were used for the series. Liberty's Kids was originally Kevin O'Donnell's idea and written by Doug McIntyre. It then was produced by DIC Entertainment and later aired on PBS Kids. The series aired on several networks until finding a home on qubo in 2012. It's a 30 minute show that includes commercials, guessing games, riddles and continental cartoons. September 2, 2002 was the airing of the first episode of Liberty's Kids which was titled Boston Tea Party. Through My Own Eyes was the theme song which was performed by Aaron Carter and Kayla. The Boston Tea Party episode was basically about characters named Sarah, Moses, James and Henri who was at the wrong place at the wrong time. They were caught in the middle of gang patriots whose sole purpose was to aboard the ship and destroy the tea cargo. In this episode Adam Sandler made a guest appearance. 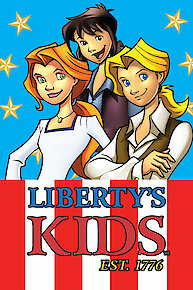 Liberty's Kids is a historical fictional television series that educates young kids about the United States history. It's an adventure for kids to explore and learn about events and heroes of America. It covers events that happened starting from 1773 to 1789 and the Revolutionary War as well as the aftermath. Liberty's Kids began on Labor Day and there were a total of 40 episodes all of which ended on April 3, 2003 but PBS continued to play the series until 2004. Shout! Factory released Liberty's Kids DVD which contained all 40 episodes on October 14, 2008. Deborah Samson masquerades as a man so she can enlist in the Continental army. Spanish Governor Bernardo de Galvez aides the American cause by capturing Baton Rouge, Natchez and Mobile from the British. Sixteen-year-old Sybil Ludington makes her own midnight ride in Westchester County, New York. Benedict Arnold fights for respect from Congress. America's leaders meet at a convention in Philadelphia and decide to write a radical new Constitution. With the signing of the Treaty of Paris, loyalists are forced to leave their homes. Many slaves move to Canada to avoid being returned to slavery. Ben Franklin and John Adams sign the peace treaty with England. In New York, some members of Washington's officer corps want him to become king. Massachusetts slave "Mum Bett" sues for her freedom. When she wins, she renames herself Elizabeth Freeman. In the climatic battle of the war, Moses' brother, a soldier for the British, is sent into harm's way and is aided by a sympathetic Hessian soldier. Virginia slave James Armistead joins Lafayette and spies on Benedict Arnold. Then, as a double agent, he gives false information to Gen. Cornwallis. Deborah Samson masquerades as a man so she can enlist in the Continental Army. Washington and French Gen. Rochambeau disagree. Virginia Governor Thomas Jefferson is forced by Benedict Arnold to abandon the governor's residence in Richmond. Benedict Arnold tries to hand West Point over to British, but his plot is uncovered when his accomplice, Maj. Andre, is captured. James travels to New York, where he meets an Iroquois chief and learns firsthand about atrocities committed by Iroquois and American alike. Sarah returns to Philadelphia. Henri gets into a scrape with a Tory boy when the Tory makes disparaging comments about Ben Franklin. Spanish Governor Bernardo de Galvez aids the American cause by capturing Baton Rouge, Natchez and Mobile from the British. Sailing to England, Sarah is shipwrecked and saved by Jones. Later, she comes to the realization that she is now, in her heart, an American. In the Ohio territory, Shawnee Chief Cornstalk and his people are caught between the Americans and the British, with tragic results. The States struggle to unite politically before the arrival of the French ambassador. Henri befriends Wappinger Abraham Nimham. News of the American victory at Saratoga helps pave the way for Ben Franklin to negotiate a treaty with France. James, Sarah and Henri are there as George Washington and his Continental Army endure a horrible winter at Valley Forge. Benedict Arnold is the true hero of the Battle of Saratoga but is angered when he fails to receive proper recognition. The 19-year-old Marquis de Lafayette arrives after an eventful journey from France and offers his services to Congress. Sixteen-year-old Sybil Ludington makes her own "midnight ride" in Westchester County, NY. Benedict Arnold fights for "respect" from Congress. Ben Franklin sets up residence in Paris and begins his uphill battle to enlist France in the American cause. Washington recrosses the Delaware River on Christmas Day. His troops defeat the sleeping Hessians at Trenton. At the low point of the war for the Americans, Washington's adjutant, Gen. Joseph Reed, questions the commander's ability to lead. Ben Franklin, appointed to a commission to negotiate a treaty with the French, sails for France aboard the Reprisal. A failed peace conference convinces the American leaders that the British have no interest in making peace. The kids, thinking they're reporting on the sighting of a "sea monster" in New York harbor, instead meet David Bushnell, the father of the submarine. At the Battle of Long Island, Washington fights the British in open-field battles -- with catastrophic results. As Hessians arrive off the coast of Staten Island, John Adams convinces Congress that independence is the only answer to the colonies' problems. James, Sarah and Henri meet Thomas Paine and learn of his belief that the common man can rule himself. George Washington arrives in Boston to take command of the army, but he has no idea if the New Englanders will follow a Virginian. When Patriot mail falls into the hands of the British, James and Sarah agree to carry important letters safely to New York. The first major battle of the war results in a victory for the crown, but at such a high cost to the British that the American cause gains momentum. The colonies decide they need a national army. John Adams nominates George Washington over other candidates to lead the new force. Ethan Allen and Benedict Arnold reluctantly join forces to capture Fort Ticonderoga in New York, thereby expanding the war beyond New England. The Revolutionary War begins with the battles of Lexington and Concord. Minutemen citizens take up arms to fight the powerful, experienced Red Coats. Paul Revere and William Dawes spread the word that the "British are coming!" on the eve of "the shot heard round the world." Episode 4 - Liberty or Death! Patrick Henry, the greatest speaker of his day, stirs the South to the cause of freedom with his famous "Give me liberty or give me death!" speech. Moses, James, Sarah and Henri hide at poet Phillis Wheatley's house in Boston, where some of His Majesty's soldiers are being quartered. Colonists in Boston rebel against "taxation without representation" by throwing a fortune in tea into the harbor. Trouble erupts in the New Hampshire Grants when settlers are forced from their homes. Ethan Allen and Benedict Arnold reluctantly join forces to capture Fort Ticonderoga in New York -- thereby expanding the war beyond New England. The first major battle of the war. The Americans, with little ammunition, "don't shoot until they see the whites of their eyes." The battle results in a victory for the Crown, but at such a high cost to the British that the American cause gains needed momentum. As Hessians arrive off the coast of Staten Island, John Adams finally convinces Congress that independence is the only answer to the colonies' problems. They ask Thomas Jefferson to write the first draft of a Declaration of Independence. Ben Franklin sets up residence in Paris and begins his uphill battle to enlist France in the American cause. Franklin's hopes are bolstered when news of the victories at Trenton and Princeton reach France. Liberty's Kids is currently available to watch and stream on PBS. You can also buy, rent Liberty's Kids on demand at Amazon Prime, Vudu, Starz, DIRECTV NOW, iTunes online.